ANZ eGate is a payment processing gateway service offered by Australia and New Zealand Banking Group Limited (ANZ). The plugin is a payment plugin that makes transaction calls with Australia and New Zealand Banking Group Limited (ANZ) eGate payment gateway. When activated it will be listed as one of your payment methods during checkout. This is a Standard Payment Plugin for nopCommerce. Customers will not be directed to ANZ eGate payment page, and will stay on your nopCommerce website to complete the payment. An account on ANZ eGate is required, of which can be obtained from ANZ eGate. 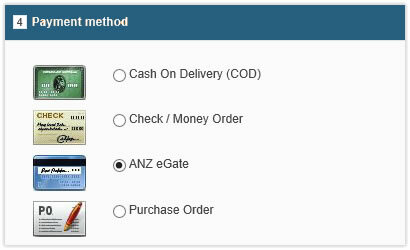 Take note of the Merchant Code and Merchant Id provided by ANZ eGate.